As the signs of aging begin to be first noticed, many people turn to Botox, and fillers to hide its onset signs. Frown lines, including the sinking in of the cheeks and the thinning of lips can all be dramatically improved. Although many seek the common Botox and Fillers solutions, Dr Zamani has been helping with a more natural and esthetic solution that the common Fillers and Botox are unable to achieve. As humans age, the skin and the underlying muscles that support, start to lost their elasticity and definition and appearance, and the lower face and the jaws starts to cave inward. 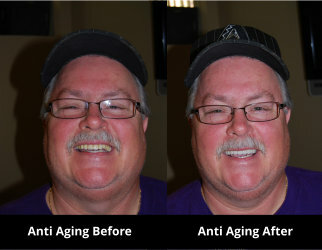 The distance between the nose and chin begins to decrease as well because the smile starts to loose structural support. Dr. Zamani has been pioneering and refining Anti Aging Dental solutions that drastically not only improve the cosmetics of the teeth, but they also improve the facial tone and symmetry of the face, skin, jaw and the face, all without any surgical intervention! Dr. Zamani can take years off your appearance without surgery. Dramatic results can be obtained through different forms of carefully planned treatments by Dr. Zamani that turn back the clock and yet improve your smile and self-confidence. Dr. Zamani uses Dentalift and Neuromuscular Dentistry to add fullness to your face, reduce wrinkles and balance and plump your lips all without any injectables or surgery. The use of Dr. Zamani’s expertise in combination with Dentalift, a revolutionary procedure utilizing a range of cosmetic dentistry options using veneers, crowns, bridge and natural porcelain products gives optimal results in gaining a natural beauty. Beautiful bright healthy teeth have long been associated with signs of youth. 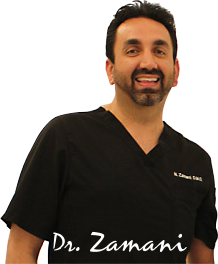 At DENT-ALL Advanced Dentistry, Dr. Zamani offers customized Smile Rejuvenations that are revolutionizing Los Angele’s pursuit of youth, beauty, and self-esteem. 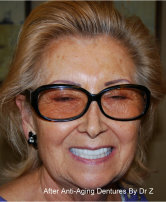 Using smile design techniques that change the size and width, color and texture of your teeth, Dr. Zamani can achieve results that remove the evidence of wrinkles around your mouth, plump up your lips, and brighten, beautify and perfect your smile without surgery. It’s important to understand how aging effects our beauty, the characteristics of our teeth and smiles can reveal the signs of aging. The color, shape, and length of our teeth change over the years due to normal wear. Gravity and natural facial changes over time make our lower faces shrink and sink in, resulting in less of our upper teeth showing as we speak and smile. Loss of collagen and diminished muscle tone allow wrinkles to form around our mouth and lips. Longer teeth and teeth that display translucency and whiter teeth portray a “younger you” before your teeth were worn down.